If you follow me on twitter then you'd have heard that I gave up coffee about six weeks ago, there were a few reasons, the main one being that I felt too reliant on it to wake me up in the morning and get me through work/uni, so whilst it's the summer I thought it was the perfect time to try without it. I'll be honest, it wasn't easy and was about 8-9 days until the headaches stopped, even though I only had 1-2 cups each day. I'm not telling you to go and give up coffee, and I'm not saying that I'll never drink another cup again, but after I did I started looking for a new breakfast smoothie to have, to replace my coffee-laced banana milkshake each morning. I tried out a few different combinations and this one is by far my favourite, it's aptly named turmeric sunrise, as it actually changes colour after blending. 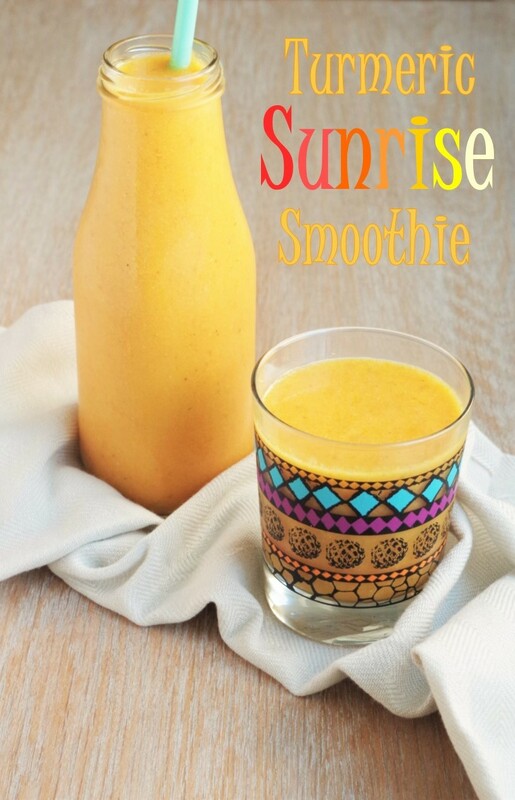 The smoothie starts off a peachy-orange colour and within about 5 minutes becomes bright yellow in colour from the fresh turmeric, which is pretty cool to see. The smoothie itself is made up of banana, fresh mango, strawberries, flax seed, fresh turmeric and some ice. It's packed with nutritional benefits, delivering 3/5 a day, omega 3 fatty acids (the essential ones), blood sugar regulation and anti inflammatory properties. To get the maximum benefits out of the flaxseed, commonly called linseed it is important that it's ground, so if you don't have a high speed blender that will mill the flaxseed whilst blending your smoothie, make sure that you grind it first. Ground flaxseed must be kept in the fridge and also used up quite quickly, so, if you can, grind it when you need it! I was reading up on turmeric the other day and it's a pretty amazing little root, it's incredibly cheap and has some great benefits, including helping the body convert the short chain omega 3's (ALA) into longer chains in the body (DHA). Turmeric also has anti inflammatory properties, it is shown to aid digestion and is high in iron, manganese, vitamin B6, potassium, copper and fibre. To efficiently convert the omega 3's in flax seed to the longer chains, it is important that you're not deficient in vitamins and minerals and the good news is, studies have shown better conversion rates from shorter (ALA) to longer chain omega 3's (DHA & EPA) in individuals who don't consume DHA or EPA (usually found in fish), so whilst our bodies have to convert the omega 3's, it seems like we're actually pretty good at it! *If you don't have a high powered blender, grind prior to adding to the blender. Prep the fruit, cut down the centre of the mango with a sharp knife, avoiding the pit, then scoop out the flesh with a spoon. Peel the turmeric and then grate into the smoothie jug. Add all the fruit to the blender, top up with water (1-2 cups), add the flaxseed and ice and blend until smooth. Serve immediately and drink it as it gradually changes colour. Enjoy!